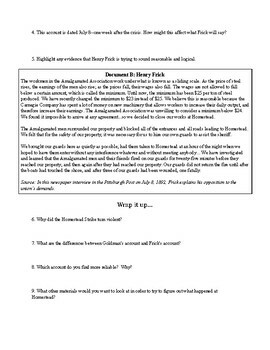 I created this worksheet using the Reading Like a Historian lesson found here (modified the readings for my middle-school students). 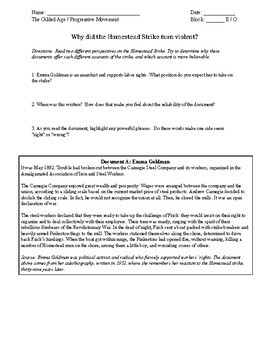 Students read two different perspectives on the Homestead Strike, try to determine why these documents offer such different accounts, and which is more believable. You can use this lesson in conjunction with this YouTube clip (www.youtube.com/watch?v=fUJLAJNO-6I) -- two interpretations of the Homestead Strike from the History Channel.